Having a timber floor enhances the value in your home, looks fantastic and feels great under your feet. It is important to understand more about timber floors to ensure you are aware of their characteristics so that when you purchase your timber floor you get the best value for money. What are the different types of timber floor styles? Solid Timber Flooring – traditionally known as a timber floor. Solid timber floors can be installed directly to concrete (generally 10 to 14mm in thickness) or on battens and joists (where the timber must be 19mm thickness). Solid timber floors are installed onto a floor in a raw state and then sanded and coated to a finish in line with the preference of the customer. Parquetry flooring also sits in this category but with much smaller pieces of timber which are installed to create patterns on the floor. Engineered Timber Flooring – uses real timber in a more sustainable way to achieve a solid timber floor appearance. Engineered timber is manufactured using a plywood type of construction where a number layers of timber (called lamellas) are pressed together and then cut into board lengths similar to solid timber boards. In most cases engineered timber floors are coated in factories prior to installation. This makes the installation process quicker but removes the option for the customer to choose their preferred type of coating. Bamboo Flooring – is an innovative way to use the bamboo plant and manufacture it into a board that has a similar appearance to a timber floor. Bamboo has its own distinct look but is often compared to and considered part of the timber flooring group of products. Laminate Flooring – is an alternative to timber when wanting to achieve a timber look in your home but without the high cost of real timber. It is a composite product of a high density fibreboard substrate and resin impregnated paper with a realistic wood design, and a hardwearing top layer that provides excellent wear resistance. Vinyl Plank Flooring – is an outstanding reproduction of the timber look with the benefits of great function at a more affordable cost. It is supplied in dimensions similar to laminate flooring of approximately 1.2 to 1.5 metre lengths. Vinyl Plank Flooring has some great benefits over other timber flooring options, – it is very very quiet and softer underfoot, it has greater resistance to liquid spills (making it suitable for installation in bathrooms), and it is well priced compared to other timber flooring options. How much does a timber floor cost? When should a timber floor be installed? Generally a timber floor should be installed after all other trades have completed work on your home with the exception of painters. As the process of installing a timber floor can create dust and occasionally minor damage to plaster, it is better to have painting completed after the timber floors. However timber flooring should not be installed until after all other trades have completed their work to avoid unnecessary risk to damage of the floor. Can Bosch Timber Floors arrange installation of my timber floor? Yes, Bosch timber floors is very happy to facilitate the installation of your timber flooring throughout Perth and Western Australia. We work with timber flooring installation specialists who will ensure your floor is installed to the correct industry standards and meets with your approval. Bosch Timber Floors only works with recognised flooring contractors who we are confident will complete a quality installation. Customers pay the installers directly for installations and provide feedback to Bosch Timber Floors confirming the installation meets expectations. Bosch Timber Floors does not profit from flooring installations helping to reduce the overall costs. 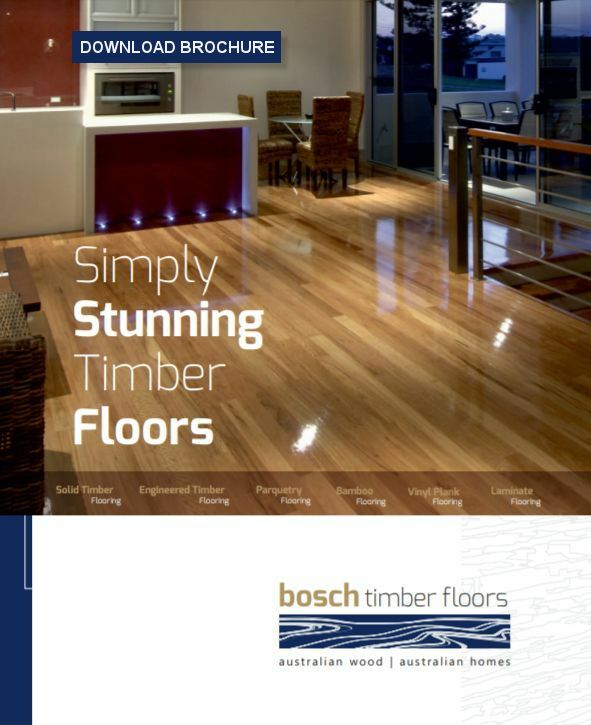 Bosch Timber Floors has agreed rates of installation with installers at fair rates. When we provide you with a price estimate on timber flooring, these rates are itemised and included in our offer so that you understand the total price of your floor. Bosch Timber Floors only work with the highest quality of installers to ensure customer satisfaction. They are continually being measured based on customer feedback as the Bosch Timber Floors brand relies on positive feedback from our customers. We have found this is the best way for customers to get a quality installation at the best possible price. Do I need to allow a cost for preparation to my concrete slab? having no significant high or low spots across the floor. On occasions where the concrete does have one or more of the above issues it is necessary to rectify the concrete prior to commencing the timber installation. This ensures a strong bond between the concrete subfloor and the timber floor, and reduces the potential for hollow spots on the finished timber floor. Where additional work on the concrete is required this needs to be charged in addition to the quote already provided for supply and installation of the timber floor. The pricing for the subfloor rectification can only be confirmed once it has been assessed. Unfortunately, this will sometimes delay the commencement of an installation if issues are noted only after a previous floor covering has been lifted. Where possible, when installers first visit a site they will assess the concrete subfloor and advise at that time if additional sub-floor rectification would be required. Rectification of a concrete slab will ensure that no major low or high spots remain however, it will not guarantee that the sub floor is completely level. Achieving a level slab is the responsibility of the builder of the home and this is not considered during the installation of the timber floor. In circumstances where the concrete subfloor is within an acceptable presentation, no additional cost is required and the floor installer will scrape, lightly sand, and clean the concrete prior to applying a vapour barrier. The vapour barrier is also a very good primer ensuring adhesion between the timber and the sub floor is strong. What are the important issues to discuss with my installer before the floor is installed? The direction you wish to have the timber floor installed. The installer will recommend the most practical suggestion for the direction of the timber however he is happy to work with you if you prefer an alternate direction. Depending on the type of timber you have, there may be some types of boards that you would prefer in less obvious positions on the floor if for example the board has a contrasting sapwood colour running though it or a gum vein that is overly large. In these situations the installer will try to accommodate all reasonable requests so long as there is understanding that not every board can be hand selected across the floor. It is also important to remember that “colour” is not considered as part of the timber grade. Consider the environment in your home and install the timber with regards to the prevalent humidity and temperature conditions including the type of air-conditioning system you have in place. Reverse cycle air conditioners reduce humidity which will reduce the moisture content of your timber over time. That the product is correct to lay by checking pack labels for size and grade, damage that may have occurred in transit, board moisture contents, cover widths and tolerances. What should I expect during the process of installing, sanding and coating a solid timber floor? Despite machines having vacuum systems, your home will be affected by some airborne dust. Taping up and closing off areas not to be installed with flooring helps to minimise the dust but it cannot be eliminated completely. Installers/Sanders vacuum at regular intervals to minimise the issue. There will be times when the occasional mark or chip out of a wall will occur during the installation or sanding of the floor. Installers/Sanders take care but cannot avoid missing walls altogether. For this reason we recommend painting of walls should be completed after the floor has been installed. Installers cannot identify all colour variations or unusual grain characteristics during the installation process. Care is taken during the process to try and install boards in line with preferences, but occasionally there can be a board that is installed outside those preferences which is not noticeable until after the coating when colour and grain variations are more noticeable. During the sanding process, timber will have putty applied to fill appearance defects, gaps, and nail holes. Every effort is made to match the putty colour as closely as possible with the timber, however on some occasions, the putty will change colour over time and will not match as closely as when first installed. For this reason, Sanders minimise the amount of putty used on the floor where practical. Before sanding commences, electricity must be operational in the house with lights working. Sanding machines draw significant power and cannot be operated from temporary supply outside the home. Once sanding the floor commences, home owners need to vacate the site to enable the best possible coating finish. Having people walk across a floor during the sanding process increases the risk of contaminants from shoes getting onto the floor which can cause the coating system to reject. The sanding process involves sanding the floor to a flat surface and then fine sanding noticeable sanding marks. Generally sanding marks should not be noticeable after coating, however if down lights are in place, it is possible to see fine “cobwebbing” sanding marks which cannot be avoided. As the floor is not sanded and coated in a factory environment it is unrealistic to expect a similar finish to that of furniture. Some finishing imperfections occur in all floors. Some dust may be trapped in the finish even when appropriate precautions are taken. Such imperfections do not generally detract from the overall beauty and appearance of your floor. Which is the best type of coating for my timber floor? In recent years, many contractors have through ongoing trials come to the view that the best coating system involves using a solvent based sealer with waterborne top coats. This system does work however there are some important considerations. Some coating manufacturers will not warranty a waterborne coating that has used a solvent sealer. In this situation the sander is responsible for the warranty of the floor. Enviropro is a waterborne system that is warranted when applied with a Toby’s GF barrier seal. Bosch Timber Floors recommends this as a preferred system when customers wish to have a mixed system. This system does help reduce “grain raise” which can be a minor side effect of waterborne sealers. Grain raise tends to result in a more textured feel to the finished floor. Solvent Sealers used with waterborne top coats tend to provide a more defined grain structure of the finished timber floor. Hardwax Oil Finishes – Oil based coatings are a traditional style of timber floor finish that are gaining interest as an alternative finish with its own niche. Oil finishes penetrate into the timber where as other finishes sit on top of the timber. The result is a more rustic and true timber finish with the colour darkening a little as compared to other finish types. A challenge with this finish has been how easy it is to scratch the surface. However, scratches are easily repaired with this coating, Scratches on polyurethane coatings often require a complete sand of the floor to repair damage in one section. Bosch Timber Floors offer and promote the high-quality Whittle Waxes ranges available in Classic low sheen and Matt and finishes. Timbers with a hardwax oil finish can also be stained to provide an enhanced look to your timber floor. What should I know about different timber grades, colours and sizes? Colour – Photos and samples generally provide a good representation of colour or grade but it’s important to realise that floors of the same species can differ markedly in both colour and appearance. Grading rules don’t apply to timber colour or variation of colour within boards so it is important that you are not relying on a single sample for an absolute guarantee of specific colour in your timber floor. Grade – Grading significantly influences the appearance of the floor, higher grades such as “select” or “standard & better” grades minimise the amount of appearance blemishes in the timber, whereas lower grades such as “standard” or “feature” grades allow a greater proportion and larger sizes of the appearance faults. Defects included in the grading rules are gum veins, surface checking (cracks), insect marks, knots and other similar appearance blemishes. Board Width – Typically, solid timber floor boards are available in 3 main widths 80-85mm, 105-110mm, and 125-130mm. The wider boards are growing in popularity as they help to create a more open feel to a space. However it is important to remember that wider boards are more susceptible to having noticeable shrinkage when conditions in the home environment are dry. Bosch timber floors make every effort to reduce this potential however in some conditions shrinkage of timber cannot be completely prevented. Coating System – Different coating systems change the appearance of a timber floor dramatically. Some individual systems are more suitable than others for home environments. At Bosch Timber floors we can show and explain the differences between, solvent based polyurethanes, waterborne polyurethanes, mixed coating systems and oil modified systems to ensure that the coating system you choose provides the right look and functionality. Which adhesives systems suitable for timber flooring? For raw timber installations – Selleys Direct Stick foaming adhesive to help reduce the potential for hollow sounding spots in your timber floor should the level underneath have some variation. This adhesive should be used together with a Selleys VBS vapour barrier applied to the concrete subfloor. This protects the timber from excessive moisture in the concrete slab being able to transmit into the timber and enables excellent adhesion of the timber to the subfloor. Do I need to acclimatise my timber? Generally, there is no requirement to acclimatise prefinished timber floors such as laminate flooring, bamboo, or engineered flooring. These products are supplied in sealed cartons and as such unless they are removed from the packaging, simply leaving them in the home environment will not have any impact. For solid timber floors acclimatisation is generally not required however in some instances it is beneficial. Kiln drying of solid timber now enables manufacturers to better supply timber at or close to the equilibrium moisture conditions of the average home in Perth. For most homes in the greater Perth area, timber will have an equilibrium moisture content (emc) of approximately 11%. This value will change slightly in different seasons. In winter it will be slightly higher and in summer slightly lower. For this reason, Bosch Timber Floors spot checks the moisture all timber in the warehouse before it is dispatched and ensures the moisture content of the timber is between 10 and 12%.This ensures the timber will be close to the likely emc value of the home environment when it is delivered and installed. On some occasions, acclimatisation is warranted as specific homes may have factors that influence the emc value. Examples of this include homes that are close to a large body of water such as the ocean or rivers, or locations in that maybe more prone to dryer conditions such as floors in upper levels of homes. When this is the case, the timber should be placed inside the home for a minimum of seven days to allow the timber moisture levels to move closer to the emc of the home environment. In this situation Bosch Timber Floors also recommends leaving the floor for 5 to 7 days between the installation and sanding and coating process so that if any movement in the floor does occur, it can be rectified during the sanding and coating process. What is the best way to look after my timber Floor? Once your timber floor is installed it is important to look after it and keep it looking good. Prefinished timber floor products can be “lived on” virtually as soon as the installation has been completed. Solid timber floors can be walked on once the final coat is dry (around 12 hours after coating) but full curing of the coating (hardening) will not occur for approximately 14 days and rugs should be not laid on the floor until after this period. In addition, the feet of all furniture must have felt pads or protectors applied. Heavy items of furniture need to be carefully positioned without dragging. Curtains or blinds should be used to protect floor areas from intense sunlight, whilst door mats are an effective means of trapping grit which can scratch floor surfaces. Seasonally, your floor will adjust to the climate and may show small shrinkage gaps at some board edges particularly during drier times of the year. It is important to be aware that if your home is locked up or empty for long periods, the risk of timber shrinkage is significantly increased as hot homes with no ventilation cause timber to lose moisture. Over time, both the floor finish and the timber exposed to light will change colour resulting in the floor appearance to be a different tone under rugs. A regular cleaning program ensures that your floor remains in good condition. Anti-static mops are effective for collecting dust and grit, as are vacuum cleaners with appropriate attachments. Damp mopping approximately every 2 weeks provides an effective deep clean and when carried out with the recommended mild cleaners, will not harm the floor. Under no circumstances should steam mops be used on timber floors. With appropriate care you will enjoy your timber floor for many years. What is a Janka Rating? A janka rating is a measure of how hard a timber is. The scale goes from 1 to 15. Most timber floors with a Janka hardness of 7 and above are suitable for timber flooring, however the harder the timber the more resistant it is to denting. Bosch Timber Floors can advise you on which timbers have higher janka ratings. How do I know which Timber floor is the best for my home? Bosch Timber Floors consultants are happy to work with you to help you work out which floor will best match your circumstances. What are the different methods for installing Timber Floors? Direct Stick – this method involves adhering the timber floor directly to a concrete or particle board floor. In this process it is expected that a vapour barrier will be applied to a concrete subfloor prior to the installation of the timber. This method provides a very solid timber floor that is quiet underfoot. Timber floor styles suitable for this method of installation are, solid timber floors, engineered timber floors and engineered bamboo floors. Solid bamboo floors are generally not suitable for installation by the direct stick method. Plank on Ply – this method involves adhering plywood to the concrete subfloor and then nailing and adhering the timber floor to the plywood. This method provides a more stable timber floor that is less prone to expansion and contraction as well as an overall flatter finished floor appearance. The plank on ply method of installation adds approximately $35 m2 in cost over a direct stick installation. Timber floor styles suitable for this method of installation are, solid timber floors, engineered timber floors and engineered bamboo floors. Installation over Battens–this method is where solid timber is nailed and adhered onto battens that may sit on a concrete subfloor or over joists. It is a very traditional form of installation that is more common in heritage style homes and gives the floor a deep sound under foot. Floors installed in this method are generally a little softer under foot. Timber installed in this fashion must have a minimum thickness of 19mm to be structurally suitable to install over a batten system. Vinyl Plank Floors – Vinyl plank floors are generally installed slightly differently to other timber floor systems. In a two-step process, the first part of the installation involves the installer preparing the subfloor by applying a feather coat screed over the floor. This evens out any imperfections in the subfloor to provide a flatter surface to install the vinyl plank floor on. A contact adhesive is then troweled over the floor with the vinyl planks laid over the adhesive. More recently a range of vinyl plank floors have been released with click together systems. This product is installed in a floating floor fashion but generally does not require an underlay. Are there different types of blackbutt timber flooring? What are they? New England Blackbutt (NSW) – has slightly darker brown tones than coastal blackbutt giving an overall appearance of a floor with slightly richer tones. This timber is not as well-known as a timber floor product and is often mistaken for coastal blackbutt. It is a very well suited to timber flooring with its excellent janka rating of 9.5. WA Blackbutt (WA) – is a highly regarded timber that has a special niche in Western Australia. WA Blackbutt can be hard to source and for this reason is often priced higher than the NSW blackbutt species. It’s colour tones are generally more in line with the New England Blackbutt however, in recent years with regrowth logs now being milled as opposed to old growth logs, the presentation of this timber has become noticeably lighter. The janka rating of this timber is a respectable 6.9. Is there a difference between NSW and Qld Spotted Gum? Yes, there is a noticeable difference in appearance between spotted gum timbers that are sourced from northern growing areas to the southern growing areas. Spotted Gum is sourced from the northern parts of Victoria all the way through New South Wales and into Southern Queensland. The timber commonly referred to a Queensland Spotted Gum has a much greater proportion of darker timbers, whilst the New South Wales timber has an overall lighter appearance. It is very important when selecting a spotted gum timber floor that you see a good representative sample of the timber before it is installed so that you are sure that the product is in line with your expectations. How do you make sure you have a suitable acoustic barrier under your timber floor is you are installing your floor in an apartment? Under the Building code of Australia (BCA) there is a requirement for all floors in residential apartments, to ensure that the flooring products they install do not transmit excessive noise to apartments below them. Officially the transmitted noise level must be less than 62 decibels when measured from the apartment below. In reality, for comfortable living, builders often look to achieve a transmitted rating of around 55 decibels or less to enable comfortable living conditions for all residents. To achieve a reduced transmission of noise to the apartments below it is common to install a rubber or cork underlay under a timber floor which provides a barrier against the transmission of noise. There is a wide range of acoustic barrier options including acoustic rated adhesives that can be considered for apartment installations. There is no single system that is right for all purposes. Other factors such as the thickness of the concrete slab and the type of ceiling system between the floors impact the result meaning that on some occasions a less expensive acoustic option can be used to still achieve an acceptable reduction of transmitted noise. Bosch Timber Floors has extensive experience with acoustic systems for timber floors and are well placed to provide advice if you are planning to install a timber floor in an apartment. Why should we choose Bosch Timber Floors as the place to purchase our timber floor? We provide great service, over 70% of our business is referred or repeat customers. We offer extensive knowledge to help customers choose the best timber floor for their needs. We provide quality timber sourced directly from Australian Timber mills. We use only quality tradesmen to install your timber floor. We understand all the intricacies of timber floors because we specialise in them. Our knowledge in this area allows you to feel confident you are getting the best possible product and the best value for money. Get in touch with the Bosch Timber Floors team!